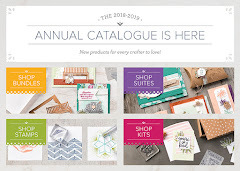 Carole's Stamping and Papercrafts: Occassions Catalogue also begins today! Occassions Catalogue also begins today! What a big day for SU! Two promotions in one day. The new Occasions will be here until the 31st May. It is full of ideas for Easter as well for all those everyday events such as birthdays and new babies. It is also a great way of earning your SAB free products! Pick up your copy at my Open House this afternoon.